If there’s two things Dr. Luvelle Brown isn’t short on, it’s enthusiasm and optimism. 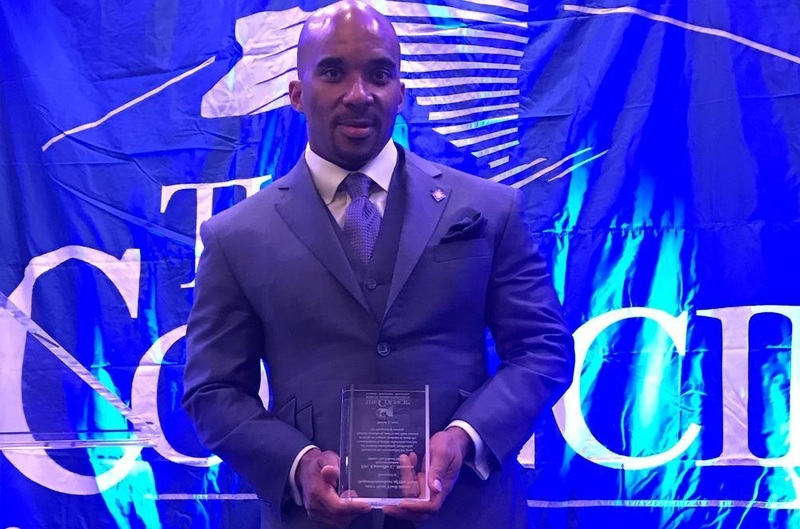 Both qualities were on full display when the Ithaca City School District superintendent received the New York Superintendent of the Year award at this year’s New York Council of School Superintendents (NYSCOSS) Winter Institute in Albany. With his entire family watching—the first time they’d all been together in several years—Brown spoke passionately about his love for students and his unique approach to community, staff, and student engagement. We were lucky enough to catch up with Brown after the ceremony. Here’s what he had to say. You often talk about creating a culture of love in schools. What do you mean by that and how did you make that a reality in Ithaca City? I speak about it, and talk about it. It’s embedded in our policies and curriculum—this approach to love. It’s defined by some key principles. Our culture is trusting, patient, kind, unselfish, truthful, forgiving and dedicated. Take all of those things together and it’s a very humble culture. Each one of these are things we talk about. When we’re making decisions—whether it’s resource allocation, policies, assessment work—we run it through this sort of litmus test to determine if it’s going to be best for our culture and our young people. So, it’s not just talking about love as a slogan. It’s really embedded in the work that we do. Board-superintendent relations are so important to school success. How do you work with board members to create a culture of support? I have approached them and they have approached me as if we are family. And, we love each other like family loves one another. Again, we work through those same principles. There have been times when they’ve had to forgive me. I’ve needed to be patient with them. We’re always striving to be truthful with one another. We break bread together. We socialize together. We hold each other accountable in ways that people can’t even imagine. The board are my toughest critics. They are the ones that push me the most. But, at the same time, I can count on and trust them. At the core of all that, every conversation and everything we do is grounded in a shared love for young people. We disallow both our individual or collective egos to ever get in the way of being part of a conversation. That is our starting point. And, when one of us or the group strays into that place where it becomes about an adult issue and not a kid one, we check ourselves and one another. When you have a new member come onto the board, how do you establish the relationship? We’ve had some transitions. That’s when I know our culture is strong. Folks coming into the culture understand how they’ll be supported and how we work. We don’t see someone coming into this as an outsider—they’re a new member of the family. We disagree on a lot. There’s different philosophies and different backgrounds. There’s a diverse group here. All that said, I think we stand as a model not only for schools but for the country on how you bring diverse viewpoints and backgrounds together for a common good in a civil and loving way. How important is community and student engagement and customer service in your schools? How do you make these strategies a priority? The priority for us is a two-way dialogue. It’s not just communication or sharing information or getting information back. We engage in a dialogue. We’re trying to do things that haven’t been done before—which we’ve done. To do that, we need to have a culture of collaboration and learning in support of our vision of thinking. To think, you have to have a dialogue. We’ve focused on that. That’s where tools like Let’s Talk!, our online community engagement solution, really come into play. We can engage in a dialogue with folks; get to people and have them get to us. It’s really about us learning with the community rather than us just sharing and communicating with the community. It’s a very different approach and different way of thinking. What do you think about Brown’s approach to student and staff engagement? Tell us in the comments. 1 Comment on "Q&A: NY supe of the year Luvelle Brown creates a culture of ‘love’ in Ithaca City"